French Tarragon (Artemisia dracunculus) or tarragon seems to be one of the least familiar of the culinary herbs that are commonly found in dried and fresh forms in grocery stores. French Tarragon is easily grown in many climates and has a wonderful anise flavor similar in some ways to basil but unlike basil will come back year after year. French Tarragon rarely sets seed so it is best to purchase a plant. When you see tarragon seed packets they are not French Tarragon and will not have the wonderful flavor and aroma of French Tarragon. Although French Tarragon is related to sagebrush and can have a slightly wild look to it the deep green color is a nice addition to the landscape. Plant French Tarragon in sun or part shade in well drained soil either in the ground or in a pot. 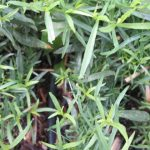 French Tarragon can get reach 2′ x 2′ or more but since you will be trimming it regularly for use the growth can be easily controlled. French Tarragon goes well with poultry, fish, meats, salads, and salad dressings, and is often used to make herbal vinegars and oils. Tarragon is an ingredient in fines herbes and Béarnaise sauce. French Tarragon is also helpful for digestion and because of its numbing effect when chewed has been used for toothache. Since it does not hold its flavor well when dried it is best to use French Tarragon fresh or freeze for later use. Pesto can be made with a many herbs other than basil – including French Tarragon. Just replace the basil with French Tarragon. Pesto can be made ahead and frozen for later use although some recommend adding the garlic just before use.